An online resource called Acronym Finder lists 123 meanings for AMA, and makes note that there are another 250 definitions in their Acronym Attic. Perhaps the most recognizable definitions are the American Music Awards, the Automobile Manufacturers Association, and the American Medical Association. Lesser known are the Academy of Magical Arts (sorry, Harry Potter), and the American Mule Association (nice site, lots of great mule photos). Another lesser known definition of the acronym AMA is the term, Against Medical Advice. This definition applies specifically to the situation that arises when a patient decides to leave the hospital against the treating physician’s advice. If the patient wants to go home, what’s the problem? It’s not a prison, after all. We see it on TV often enough. Last year, BBC’s Sherlock Holmes took off from his hospital room after being admitted with a gunshot wound to his chest. No one mentioned that he should have signed an AMA form before leaving. But maybe it’s different in London. We’re here in America. Besides, it was Benedict Cumberbatch, and he’s so loveable, we’d forgive him anything. It turns out there are a number of potential problems related to patients who sign out AMA. Problems for the patient, the treating physician, and the hospital. For the patient who bolts before allowing a full evaluation of his or her care, the consequences can be dire. That nagging pain between the shoulder blades could develop several hours later into a full-blown and fatal heart attack. For the physician who signs out an angry and hostile patient without fully explaining the dangers in leaving without treatment, there may be a medical liability lawsuit on the horizon. Doctors are cautioned to try every avenue to avoid the AMA discharge situation. If all else fails, the patient must be asked to sign the AMA form. Even then, there have been many cases where plaintiffs successfully sued hospitals and doctors following AMA discharges. 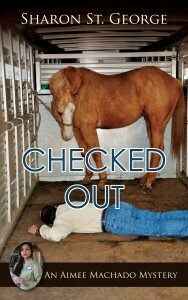 In CHECKED OUT, rodeo cowboy Cody O’Brien suffers the fatal consequences of leaving Timbergate Medical Center against medical advice. Published by Camel Press, this second book in the Aimee Machado Mystery Series was released October 1, 2015. It can be purchased online in paperback and as an eBook through Amazon.com via this link: http://tinyurl.com/oglp496 Checked Out is also available online from Barnes and Noble, or by order at your local bookstore.